Alvarez & Marsal has published the Chartered Institute of Management Accounts (CIMA) Report in partnership with Chartered Global Management Accountant (CGMA), the Chairman’s Forum and the Airmic. 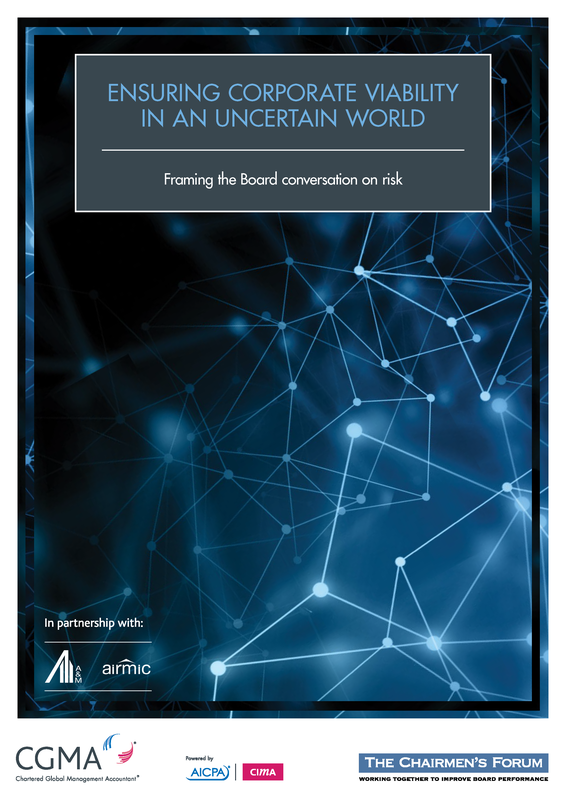 This guide is first of its kind to offer practical advice on risk to Boards based upon research and consultation with 21 FTSE Chairmen and 27 other senior board directors and risk specialists. It presents an integrated approach for boards on managing and reporting risk and it highlights best practices for Boards of companies operating internationally. The CIMA Report seeks to ensure business resilience and to assure stakeholders of the long-term viability of companies. Tom Teixeira, Managing Director in A&M’s Insurance and Risk Advisory Services practice and a leading contributor to this report, commented on the Viability Statement. He specifically recommends that an integrated approach is required when producing a company’s Viability Statement. The guide also includes a foreword from Sir Win Bischoff, Chairman of the FRC, an introduction from Sir Peter Gershon, Chairman of National Grid and Tate & Lyle, and a conversation with Sir Roger Carr, Chairman of BAE Systems.